Creating the right atmosphere in your reception area is crucial. Whether it’s for customers, clients, or just your own staff, make first impressions count with quality reception furniture from Office Kit. Our popular White Gloss Reception desks are ideal for creating a slick and contemporary setting in which to welcome guests. This style will suit a variety of offices, with the most recent industries to invest in this look including healthcare, digital, beauty and many more. State of the art task chairs, such as our Z101 task chair, work well in super modern settings with contoured padding, ergonomically adjustable features and bold upholstery in a slick orange and white combination. View our full range of reception task chairs here. We also have a range of complementing storage units available including our Tambour Cupboard, perfect for filing reception paperwork and essentials. Making sure your guests are comfy while they wait is another important factor to consider for your reception area. Our most popular range of reception chairs are the faux leather tub chairs, currently available in either black or electric blue, which sit well with the super stylish Noguchi Style Coffee Table. The table is also availble in range of wood finishes to suit your chosen décor. 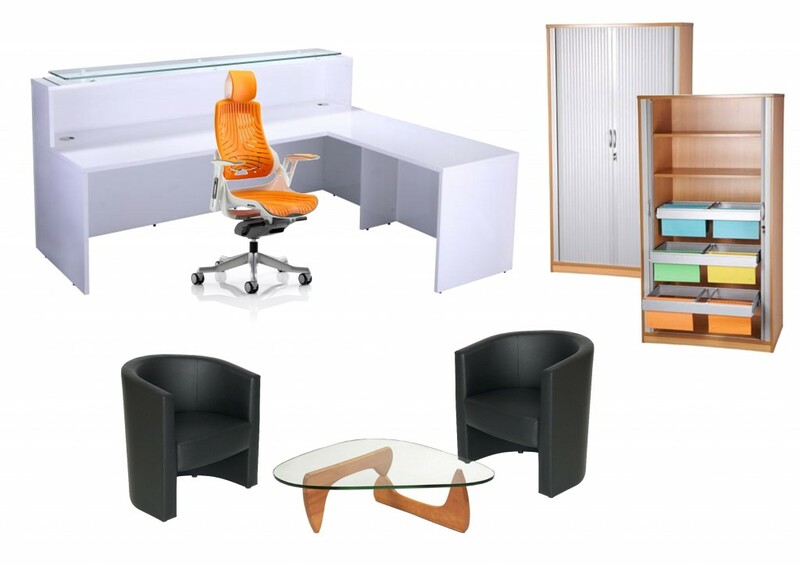 View our full range of Made in the UK Office Furniture here. We understand each company’s reception requirements are different, be it aesthetic or functional, which is why Office Kit is pleased to offer a bespoke reception counter design and build service. This in-demand service enables our customers to get exactly what they need and want with the benefit of having a design that is completely unique to them, their space, and design requirements. Here is a recent example of a custom reception desk we designed and built. Call us today on 01329 822522 to discuss what you need or pop into our showroom, find us here.